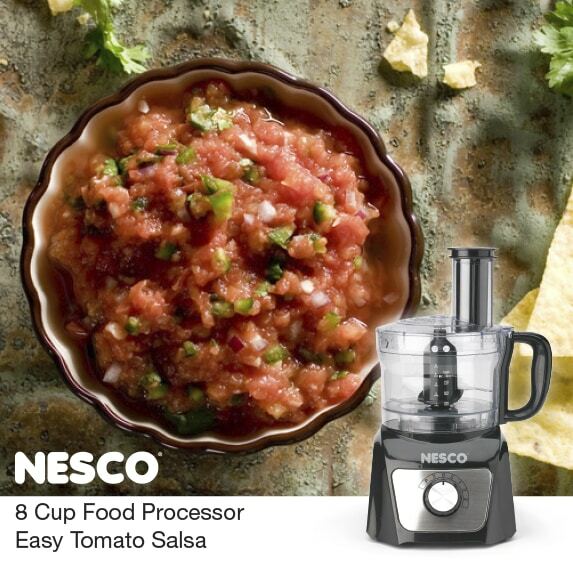 The NESCO 8 Cup Food Processor makes fresh salsa fast and easy. The recipe below includes green bell pepper for bit of crunch and color along with its zesty flavor. However many people prefer to use a yellow or red pepper for its slightly lighter taste. Also, for less heat simply remove the jalapeno seeds before finely chopping. Place the tomatoes, green bell pepper, onion, cilantro, lime juice, jalapeno pepper, cumin, salt, and pepper in the food processor. Pulse to chop and blend. Serve and enjoy!